This beguiling chili-ginger sauce is almost a spicy barbecue, or Paleo hoisin sauce. Similar ingredients, totally unique flavors, yet all slightly different. What they have most in common is that they all smother your food with delectable savoriness. And what can be more exciting than that? The combination of fresh orange juice, coconut aminos, garlic, ginger, honey and spices makes us immediately say “Yes, please!”. 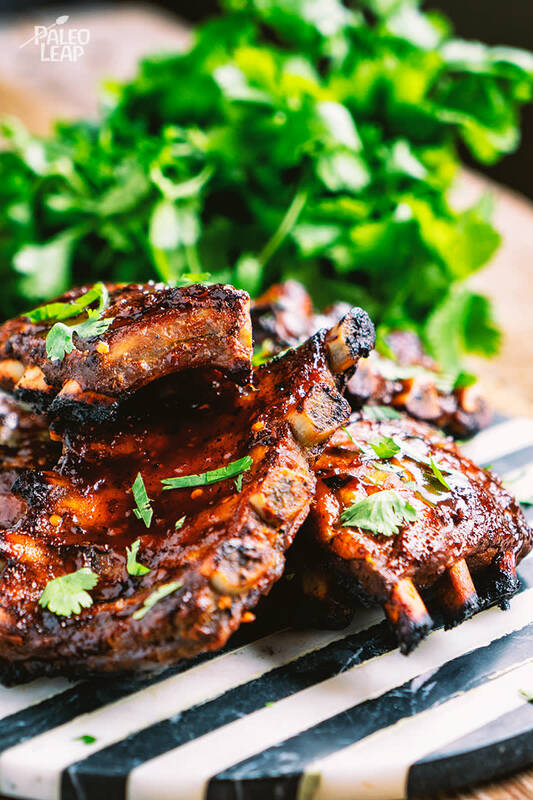 It sounds good, and it tastes even better – hold the spiciness at bay to keep it child-friendly and watch everyone chow down on those baby back ribs. Finger food reminds us of our past, stirring up memories of our primal origins. When we use our hands to eat, we soften the formality of dining and immediately forget about spoons banging on the side of the soup bowl. What we break in terms of “etiquette”, we make up for in satisfying our senses, as well as stimulating the process of digestion even before the food touches our anxiously awaiting tongues. The moment you pick up a portion of maple-barbecue ribs you’ll feel a deeper connection to your food, and chances are that you will enjoy it more too. In the spirit of finger food, we suggest some zesty, grilled sweet potato wedges to complement the falling-off-the-bone sweet chili and ginger ribs. Perhaps with a tall glass of thyme lemonade on the side and some fresh cilantro to garnish? Season both sides of the ribs with salt and a generous amount of pepper then place, meat-side up, into a large roasting pan or rimmed baking sheet. Cover and cook in the preheated oven 3 to 4 hours, or until meat begins to fall off the bone. In a saucepan heat the oil, then add the garlic, onion and ginger. Cook until soft and fragrant, then add all of the remaining ingredients except the cilantro; season to taste. Bring the sauce to a light boil and simmer 12 to 15 minutes, stirring occasionally. Once the ribs are done, preheat broiler to high. Uncover the ribs and generously brush with the chili-ginger sauce on both sides. Broil the ribs 3 to 4 minutes per side, or until the sauce begins to caramelize.